I envy you. I have always wanted an orchard. In a book by L.M. Montgomery calld The Story Girl, the family had an orchard but instead of having Macintosh or Spartan or Granny Smith, they called the tree after a family member who planted or had that fruit as a particular favourite. So you would be eating Aunt Susan's apples instead of Macintosh. Always thought that was a lovely way to remember people. I have a question for future you. How are the whips doing? Did they grow quickly ( for a tree)? 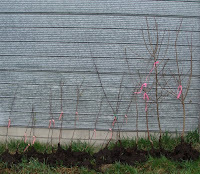 We have a farm and would like to grow some fruit trees along the fence line. Finally talked my husband into it. Not an orchard but the next best thing. I am very much enjoying your blog . The trees grew fairly fast and well until the very dry summer of 2012, when we lost a lot of them to the drought. But the survivors are still going strong. They're still not huge - shorter than me, certainly - unlike the apricot and plum trees which are now twice my height!